Johann van Graan wants to take an ‘inter-linked’ look at each area rather than single one department out for praise. So often, games of rugby get decided by little more than a good call at a bad time… or a bad one. What options did players take, which did they pass up? And what better choices were available? 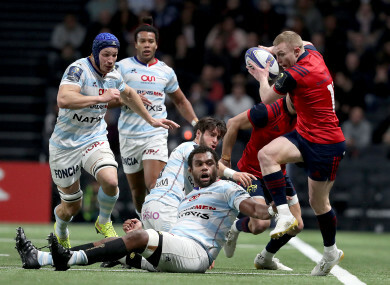 In the wake of an excellent performance away to Racing 92 in Paris — that so nearly brought victory until the iron will of Donnacha Ryan and two poorly-dealt-with restarts tilted the contest the way of the hosts — it’s natural to look at one or two of the glaring missed opportunities. However, it should also be massively encouraging that there are numerous missed chances to speak of even after Munster ran in three tries away to a European powerhouse. While the excellence of Munster’s back three has played a massive role in the attack’s potency, Johann Van Graan rightly points to an ‘inter-linked’ ethos that helps create the space for his pacy line-breaking threats. “I don’t think it’s about taking it out wide,” says the head coach. “If you look at Earlsy’s try, he actually came off of his wing. He was in midfield, it was actually forwards on his inside that created space for him. Since taking the hot seat in Limerick, Van Graan has succeeded in taking the baton on, developing a gameplan that was solid and functional last season under Rassie Erasmus. Latterly in this campaign, Van Graan’s team have happily blurred the delineation between positions and historical constraints that go with them – never more so than when Murray has been hoisted up in a line-out. “Against Connacht when the backs scored a try off set-piece you gave them credit for that, but it’s inter-linked. You do need to win the advantage line first before you can do anything in rugby. You do need to go forward. It’s not about taking it wide or not. Of course, we are still discussing a defeat. And Munster will need other results to go their way along with supplying a bonus point win of their own against Castres if they are to secure a home Champions Cup quarter-final this weekend. Again, the issue of discipline was high on the post-match agenda after Maxime Machenaud took the hosts man of the match gong having slotted five penalties – including one on the stroke of half-time which was out of range until dissent from Peter O’Mahony saw referee Matt Carley move the tee forward. Just as they did at home to Connacht though, Munster managed to stem the flow and the two late scores that won the game for Racing brought the penalty count to 11 apiece. They’re the bad pictures, but Munster look capable of creating plenty of good ones in attack these days as, even in defeat they have scored three tries against Racing and four against Leinster. “We spoke about it. I don’t think there is anything wrong with ability. “Sometimes you have to give the opposition (Racing) credit as well. With two penalties that went into the post… we created opportunities. We came back from 10-0 and 18-7 away from home and (turned) that into leads. “It’s just a bit of decision-making and we need to improve as a group. We are seeing it in a very positive light. “We need to win this weekend to stay alive in this competition. The big thing is, like all European games over the weekend, there will be big moments and we need to win those big moments. Email “Expansive Munster attack about 'inter-linked' approach for Van Graan”. Feedback on “Expansive Munster attack about 'inter-linked' approach for Van Graan”.